Unlike a lot of other comic book characters, Daredevil’s past is relatively uncluttered in terms of continuity. The inconsistencies between different takes on the character that do exist, mostly have to do with Matt Murdock’s early life; specifically the circumstances of his fateful accident, and the timing of the death of his father Jack Murdock. 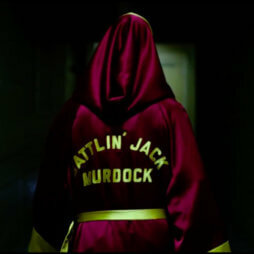 The origin has also been added to in various ways through mini-series such as Daredevil: Father and Daredevil: Battlin’ Jack Murdock. I have written about some of the most significant cases of “conflicting continuity” in a previous post, so I do suggest you check that out, but I will be revisiting several of those points here, as we combine what we know about the various takes on the origin story with the few glimpses we’ve been given into the life of young Matt in the upcoming Netflix series. And, my thoughts on the substance that blinded him? I will get to that too! In the most recent live footage we’ve seen, a thirty second TV spot (see below), Matt says that he was blinded at the age of nine when Stick asks him about it. There’s no way of knowing, just from this clip, how much time is supposed to have elapsed between the accident and his first meeting with Stick, though it seems unlikely to me that he would give his age as “nine” if he were still nine at the time. Either way, it appears that Matt’s accident is happening earlier the farther away we get from his first appearance back in 1964. 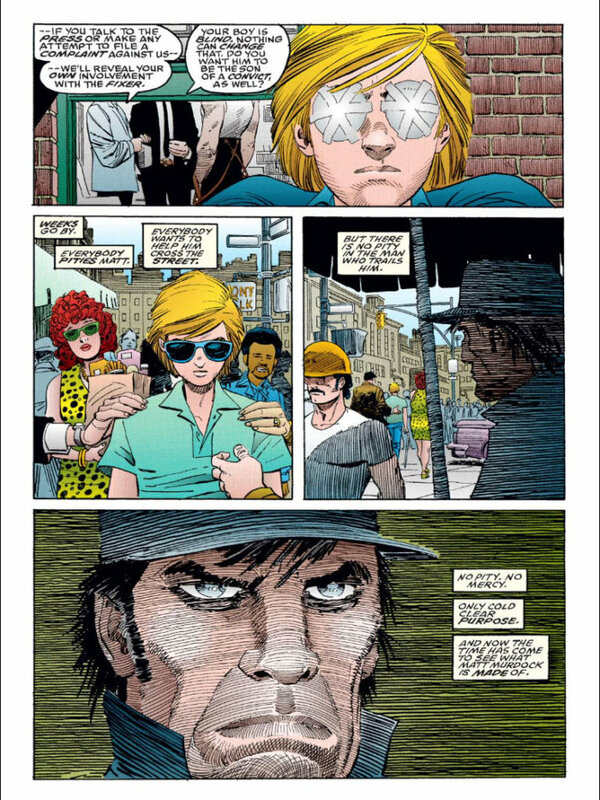 In Daredevil #3 (vol 1), he says that he was fifteen when he went blind. In The Price (Daredevil #223, vol1, see yesterday’s post), he mentions that he was “barely into my teens” at the time. In the mini-series Daredevil: The Man Without Fear, by Frank Miller, Matt looks quite a bit younger than that in the hands of artist John Romita Jr. If you look at the bonus material near the back of the second Frank Miller omnibus (which collects The Man Without Fear), there’s a rough draft from 1988 of the story – which went by Blind Justice at the time – and it actually gives Matt’s age as sixteen. You wouldn’t think it from reading the finished graphic novel, however, and I suspect that might have influenced the general perception that Matt was just a child at the time of the accident. In the 2003 movie, actor Scott Terra was fourteen when he played young Matt Murdock, though he looks like he could be a year or two younger than that. 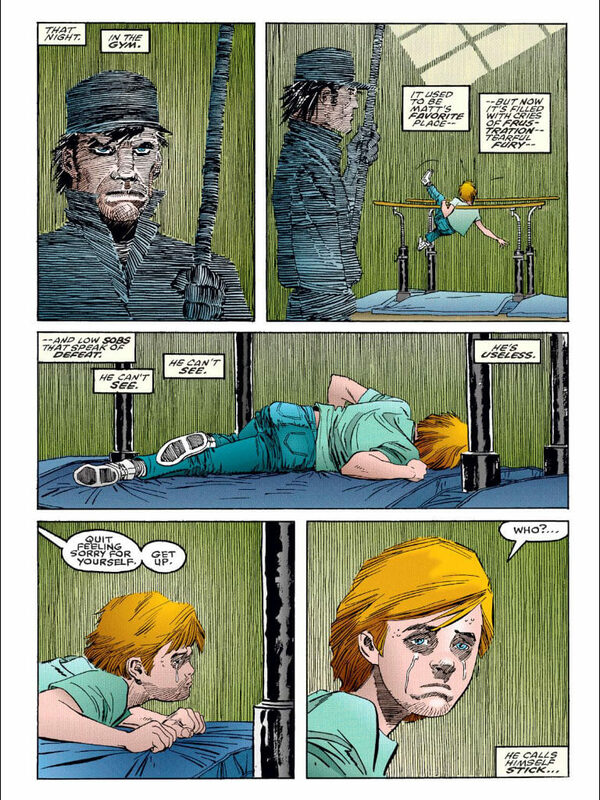 And, in a volume 2 issue by Brian Bendis and Alex Maleev, a flashback of Jack’s murder – more on that below – shows Matt looking like he may be as young as eight. With the new Netflix show, it’s clear that the timescale has indeed shifted compared to Stan Lee’s original story. People who haven’t read Silver Age Daredevil – or the Brubaker/Lark run, for that matter – may be forgiven for assuming that Jack Murdock died when Matt was very young. That’s what happened in the 2003 movie, and it’s clearly what happened in the Bendis/Maleev story I mentioned. It also appears to be what happened in The Man Without Fear, again mostly due to the art which makes Matt look very young for his age. A careful reading will reveal that only a year has passed between Jack’s murder and Matt’s first day of college. The original version of events actually have Jack dying shortly before Matt graduates from law school (or finishes his undergraduate studies, Stan Lee appears to have forgotten that you need to go to law school to be a lawyer). I have always preferred this take on the origin. First of all, it has Jack’s death and Matt becoming Daredevil – and staring his legal career! – happening in rapid succession, which makes sense considering they’re all connected. 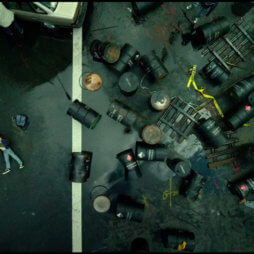 In The Man Without Fear, Matt avenges Jack’s death before becoming Daredevil, wearing the black costume that has clearly served as the inspiration for the costume in the Daredevil show, though the revenge comes shortly after his father’s death. It appears from the photo of the crime scene, above on the far right, that the Netflix show will go the route of having a Matt who was blinded at a very young age also lose his father at a young age, along the lines of what we saw in the 2003 movie and what can be inferred from the Bendis/Maleev run. There are a couple of problems with this approach: 1) What finally prompts Matt to become Daredevil many years later, and 2) who took care of him all those years when he was still a child? With over twelve hours of footage, I wonder if and how the show’s creators will address this gap? One thing that my guest Claire and I joked about in a recent podcast was whether the “young Matt hypothesis” would leave poor Matt to be raised by his mentor Stick. Because there can be no doubt about it, Stick would be a truly awful parent. In the comics, he doled out the kind of tough love that probably should have prompted a call to child protective services, had anyone actually known about it. Joking aside, the inclusion of Stick is a very smart move. 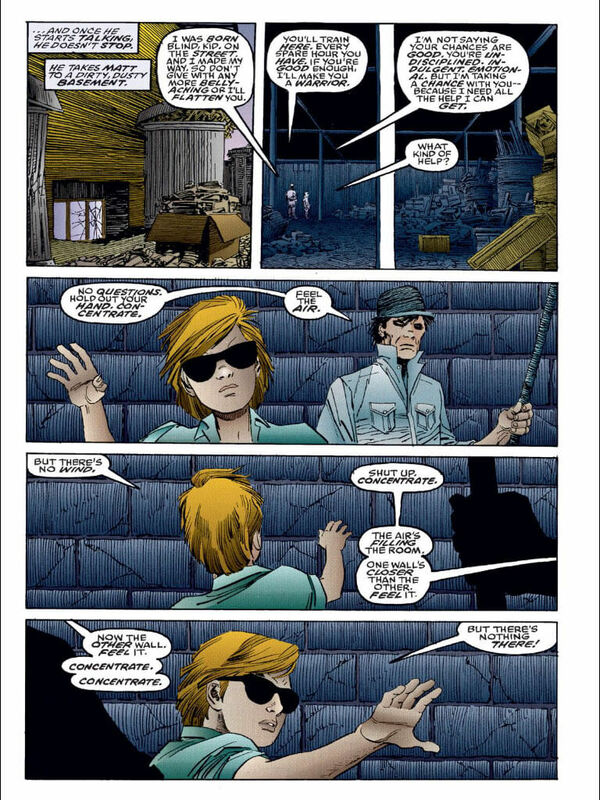 When he was introduced in the comics, during Frank Miller’s first run on the book, he made the concept of blind youngster with heightened senses turning to life as a vigilante seem much less implausible. Stick is himself blind, from birth, and it makes sense that Matt would benefit from learning from someone like himself. Radioactive goo – or something else? I wanted to end with just a few words about the technical aspects of Matt’s accident. One difference that jumped out at me between the scene in the TV spot clip above and the corresponding one from the Daredevil movie is the perspective. In the 2003 movie, we almost seem to be looking at it from the “point of view” of the blinding agent, working its way into Matt’s body, seemingly adding its magic as it goes. In the Netflix take on it, you actually see it from Matt’s perspective, as his visual field narrows and his sight is destroyed. It’s actually quite dramatic, and really emphasizes how deeply traumatic the event would have been for young Matt. What’s odd, though, is that the grown Matt shows no visible signs of the ordeal. I know that Charlie Cox mentioned in his podcast interview with EJ Scott that they didn’t want to do anything dramatic with the eyes since that would be a bit cliché. While I’d normally agree, I’d argue that Matt’s case is different from that of most blind people whose eyes often do look completely normal. After all, he lost his sight in an accident severe enough to blind him nearly instantly. So, will the blinding agent actually be radioactive? We can’t know at this point, but I suspect they might change that part of it up a bit, or simply leave out the details of the chemical and physical nature of the substance. Matt doesn’t seem to be getting very much of it on him in the footage we’ve seen, so it’s clearly something very potent. Ionizing radiation from a radioactive compound is far from the only factor that can cause mutations in living organisms (there is a long list of chemical agents that damage DNA), so it’s certainly possible to go the mutation route – if that’s what they choose to do – and still stay clear of the radioactivity and its 60s connotations. Okay, that’s it for now! I’ll see you back here tomorrow! I was a bit disappointed that his eyes were still the same. They could have at least used contacts to change the colour slightly. But alas, it’s a bit late for that. Wasn’t there a flashback with Stick in Waid’s run where Matt looked really young? I can’t remember which issue. And omg, Stick would be the WORST caretaker. There was. I think it was #22, (Spider-Ock) but I’m too lazy to look it up now. Matt did look young, maybe 12, but I could believe ’14–15′ but a late bloomer. I think it was issue #25… the fight with Ikari. I said this in another post, but I don’t like having Matt be so young as it brings in a more obvious Batman parallel and Daredevil has enough of those already. I’ve always disliked the original origin for the very reasons you liked it. To me, having Jack die right as Matt becomes a lawyer and Matt suddenly deciding to put on a costume and be a superhero in very short order is 1) way too much like Spiderman and 2) reeks of silver age cheesiness. I much prefer the idea of orphaned and abandoned Matt going off to college feeling alone and lost, which is why his friendship with Foggy is so strong and why he fell so head over heals for Elektra. Also it makes so much more sense for him actually start his career for a while and slowly realize that with his skills he can do more than fight injustice in a courtroom as the law doesn’t always work. Sadly i’m thinking this (the origin) will be one of the hopefully few areas where the new show will come up lacking. It will likely be a very basic origin compressed into Matt Murdock age 9-10. He gets blinded. Dad teaches him to “never give up”. Dad dies. Meets Stick. Gets trained by Stick. Now maybe they will have some mention of him being “raised” by Stick after his Dad’s death, but I doubt it. Even if they do go that route, there’s no guarantee that Stick will be as abusive as Frank Miller’s version. That aspect could be toned down a lot and still keep the essence of the character. I prefer the notion that Matt went blind at 9 rather than in his teens. For one thing, at that age the brain is more flexible than after puberty which helps explain how well Matt adapted to his changed perception of the world. It gives him time to learn braille and adjust to being blind – while not impossible for someone to be blinded at 16 or so then go off to college but he’d still be adjusting, still gaining fluency in braille and learning to use various aids that someone studying an intensive subject like law would need to master in addition to mastering the course content. As we now know, the series did address who took care of Matt during those years. I’m sort of divided on the eyes thing. Cox does a decent job of trying for the unfocused stare of the blind, but once in awhile he can’t help but let his eyes focus/converge because he is, after all, sighted. Wearing a mask or dark glasses during a lot of the story gets around that somewhat. It’s a bit of a cliche that blind people have “cloudy” eyes but not all of them do, even those blinded by accident. It comes down to the mechanism that blinded him. If the chemical was caustic or corrosive it would scar the surface of the eye, resulting in that cloudy appearance – but these days that can sometimes be corrected by a cornea transplant (not always). If the chemical caused nerve damage, though, his eyes might look normal but have no functional nerves – which would also account for them being, as Claire stated, completely non-reactive to light. If they are, that means even the reflex action of the pupils is not functioning, which does imply nerve damage of some sort. There are chemicals that particularly target the optic nerves, some of them surprisingly common such as wood alcohol. From a practical standpoint, not using contacts increase the comfort of the actor, slices a bit off the cost, and is one less thing for continuity to get wrong. In the Netflix series we don’t get an explanation of what, exactly, the goo that got in Matt’s eyes was, which is probably for the best. No green glowing stuff, no specification of its properties, just that if you get it in your eyes it’s going to blind you even if it can’t get through your intact skin. That’s not so outlandish a characteristic, and gets away from the Silver Age meme that radioactivity makes superheroes.